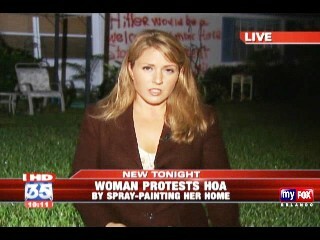 SATELLITE BEACH, Fla. (WOFL FOX 35) - A homeowner defaced her own home and is thumbing her nose at her home owners association and neighbors. It happened in the Indian Harbor area of Satellite Beach at the Town House Estates. Sheila Jones and her family have lived at the Town House Estates home for only 18 months but say its been a nightmare since day one. Jones says neighbors have complained about her potted plants and the number of cars she has parked outside of her home. She says they have also sent her angry letters calling her 'white trash.' 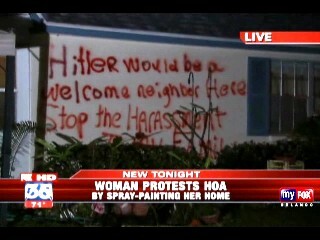 This week she said she "snapped," and made her feelings known by using her home as the canvas writing,"Hitler would be a welcome neighbor here. Stop the harassment to my family. Merry Xmas." "I was gonna paint it over this morning it was done in the moment and I guess the Hitler thing is the thing that really pushed people over the edge. I feel I'm living in a communist community and you know they can jab you and jab you and jab you and they don't have to stop," said homeowner Sheila Jones. Neighbors and Jones' home owners association are not amused. "They don't belong here for the simple reasons, because when you live in an association, there are rules you've got to live by and they haven't lived by one of them," said Pat Cutwright who lives next to Jones. Town House Estates HOA President Frank Lady says in a statement that the graffiti is not only a city code violation of unauthorized painting, but is also a violation of the association's bylaws. 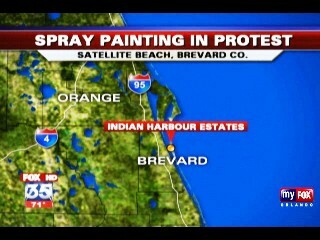 The HOA has talked with the Indian Harbor Police about the graffiti and will be cooperating with law enforcement.